October 10, 2014 by Ecommerce News. About Statistics with tags Denmark, Estonia, Finland, Iceland, Latvia, Lithuania, Norway, Sweden. 4086 views. The total ecommerce industry in Northern Europe is expected to reach sales of 36.8 billion euros in 2014. One year ago, the online economy of goods and services in this region was worth 33.2 billion euros, so this year there’s probably gonna be a growth of 10.8%. This prediction is done by Ecommerce Europe, which regularly publishes ecommerce reports about the various regions in Europe. The ecommerce figures were established in cooperation with national ecommerce associations and GfK. The Northern European region consists of Sweden, Denmark, Finland, Norway, Iceland, Estonia, Latvia and Lithuania, and is now in fourth position in terms of ecommerce size. Together, these four countries account for 9.1% of total online sales in Europe. Although the growth rate has declined (2014: +10.8%, 2013: +13.7%), the region is developing extremely well, says Ecommerce Europe. Denmark was the strongest ecommerce country in Northern Europe two years, but with online sales amounting to 8.3 billion euros (regional market share of 25.1%) now has to deal with a third place. Last year Norway appeared to be the strongest ecommerce country in the region, with a market share of 26.9% and total online sales of 8.9 billion euros. Sweden (€8.6bn, 25.9%) and Finland (€6.6bn, 19.9%) were ranked second and fourth respectively. Of course, these four countries dominate the ecommerce market in Northern Europe, but still countries like Iceland and the Baltic States experienced some serious ecommerce growth, with percentages between 15% and 30% last year.” However, in the coming years the North European e-commerce growth is expected to level off as the e-commerce markets in this region are becoming saturated”, Ecommerce Europe writes. The average Northern European online shopper spent 1,780 euros online last year and the region has had 18.6 million consumers buying goods and services online in 2013. Last year, the Northern European population was estimated at 32.2 million people, which corresponds to 3.9 of Europe’s total population. Internet penetration in this region (87%) was way above the European average of 74% in 2013. 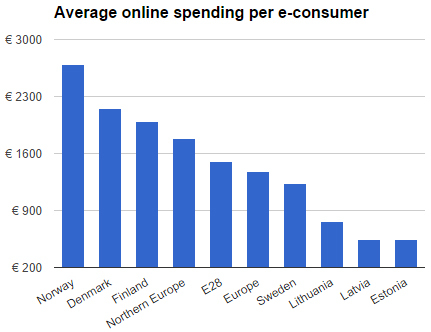 You can download a free light version of the Northern Europe B2C Ecommerce report here. More about Denmark, Estonia, Finland, Iceland, Latvia, Lithuania, Norway or Sweden.